The Sci-Fi Chronicles book has proven itself to be an absolute joy so far, and I am loving diving deeper into things I only knew peripherally. For instance… King Kong! This installment sees the colossal ape (much bigger in this version than he’s been in the American films to date, but his size seems to change throughout the film depending on where he is. That’s not the point, the point is… this time he is taking on that other famous monster that has no respect for property… Godzilla!!! I had so much fun watching this film, it’s light, goofy, and watching Kong and Godzilla go at it was a hoot! A Japanese advertising/publishing company, Pacific Pharmaceutical, is looking for a new image, a new icon that will help them sell their product… when the editor, Tako (Ichiro Arishima) hears of a rumor of an island in the South Seas that may house a monster of some sort, he sends two of his men, Sakurai (Tadao Takashima) and Kinsaburo (Yu Fujiki) out to investigate and return with the goods. Meanwhile in the arctic, a US nuclear submarine, the Seahawk, gets trapped by an iceberg, and in its attempt to free itself, releases the contents of the ice… Godzilla! The beast promptly destroys the submarine, and trashes a nearby army base (brought to life with model work that would be laughable if it wasn’t so damned charming!). On Faro Island, the reps from Pacific Pharmaceutical arrive and have a hard time believing that there is any real monster on the island, until a giant (land-bound) octopus attacks a small hut, and Kong, in a fury, comes to their aid. The reps watch stunned as the giant ape makes light work of the creature, and then promptly drinks himself into a stupor from a juice made from the island’s red berries. Really. 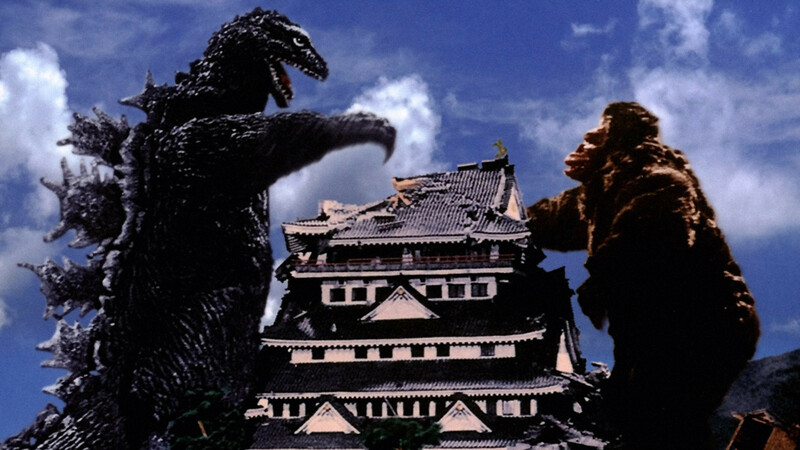 Receiving word that Godzilla is on the loose, everyone starts to wonder if Kong would be able to take the King of Monsters and build a giant raft to drag him back to Japan on. Unfortunately on the way, Kong wakes, frees himself from his bonds, and makes his own way -trashing anything that gets in his way. There’s a nice moment here when Customs considers the fact that they weren’t advised of Kong’s arrival as breaking the law, in fact, falling into the category of smuggled goods, and that Pacific Pharmaceuticals will be held responsible for any damages the beast may cause… uh oh. I’d hate to see their bill by the end of this movie! And sadly, this is a perfect comedic thread that isn’t followed up for the rest of the movie! Sigh. As both monsters, men in suits, of course, tear the landscapes apart, they finally bump into one another, and have a couple of knockdown fights, though Godzilla’s fire breath definitely gives him an edge. This one was just a sheer joy to watch, I was laughing, loved the cheesy model work, and of course the big ole wrestling matches between these two titans! !